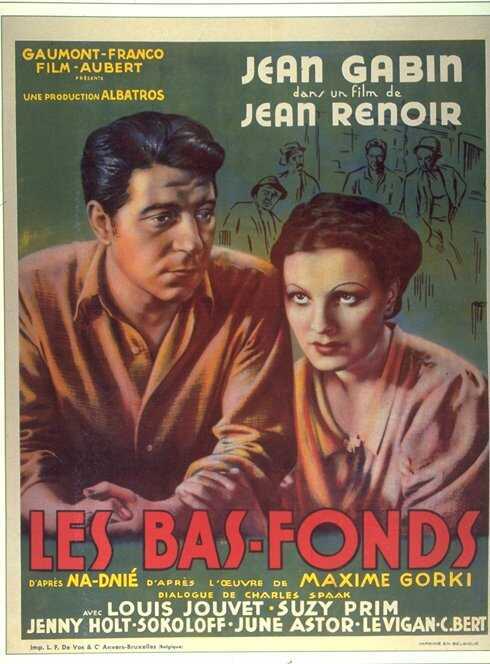 Another excellent Renoir/Gabin Collaboration Jean Renoir's version of Gorky's Lower Depths is less faithful to the original than Kurosawa's film, but has its own charm.The film centers on Jean Gabin's character, the thief, and Louis Jouvet's character of the gambling baron, recently reduced to poverty through his embezzling and gambling losses.The scenes with Gabin and Jouvet together are tremendous, including their first meeting where Gabin is robbing Jouvet's mansion, later on lying in the summer grass recalling their past lives and their final parting. The other inhabitants of the flophouse, with a few exceptions, are not as delineated as in the Kurosawa version.This is not an ensemble acting piece like Kurosawa's, but very much a Gabin star vehicle. He and Jouvet really carry the film and make it one of Renoir's best.It's not in the same league as Grand Illusion and Rules of the Game, but very good.Four of 5 stars.